Because of the interest shown by many bonsai enthusiasts to keeping bonsai indoors, thereby enjoying this hobby year round, I am instituting this new monthly column. First let me state my viewpoint on this subject. All plants are outdoor plants in their native regions. 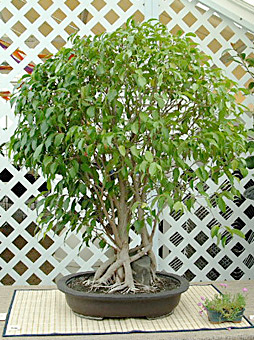 Therefore, you will never hear me use the term indoor bonsai. During our summer months we are able to grow tropical bonsai out of doors as we would any other bonsai. However, when the outside temperatures begin to drop to 50 degrees, our tropical bonsai can not remain outdoors any longer. Since they are native to warmer climes, we must then bring them indoors where the temperatures are more suitable. Hence the term (shudder) indoor bonsai. Some tropical bonsai enthusiasts keep them indoors all year but it is recommended that they should enjoy summer out of doors. 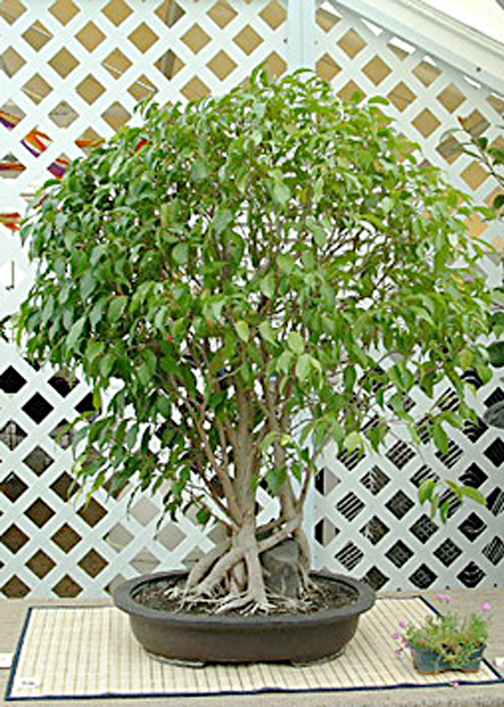 Many Ficus varieties, Serrisa, Boxwood, Fukien Tea, Bougainvillea, Eugenia, Bahama Berry, Some Chinese Elm varieties, Some azalea varieties and countless others. Tropical bonsai require care and maintenance somewhat different from our other bonsai. I will attempt to cover their monthly needs in this column.